In a growing European electricity market, the numbers of commercial transactions taking place are rising fast. The mechanisms used to allocate capacities to market players are a means of managing the "scarcity" of available capacities, whilst guaranteeing the reliability of the European power system and the security of supply. As early as 2001, RTE and National Grid, the British Transmission System Operator (TSO), pioneered a new system by auctioning transfer capacities on the undersea link between France and the UK. This innovation led to a new EU Regulation. 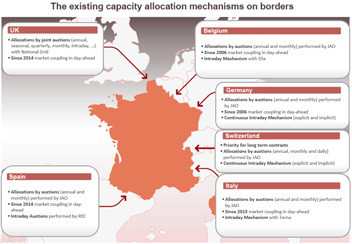 In line with that new Regulation, RTE now allocates available interconnection capacities via an auction mechanism on all its borders. These allocation methods help to ensure that requests for capacity are met in a transparent and non-discriminatory manner. The map below shows the capacity allocation mechanisms used by RTE with neighbouring TSOs.